Definition: The Expansion through Integration means combining one or more present operation of the business with no change in the customer groups. This combination can be done through a value chain. The value chain comprises of interlinked activities performed by an organization right from the procurement of raw materials to the marketing of finished goods. Thus, a firm may move up or down the value chain to focus more comprehensively on the needs of the existing customers. 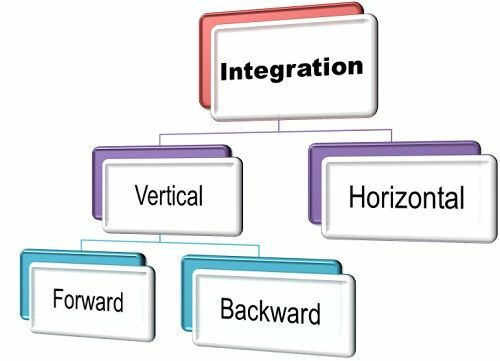 Vertical integration: The vertical integration is of two types: forward and backward. When an organization moves close to the ultimate customers, i.e. facilitate the sale of the finished goods is said to have made a forward integration. Example, the manufacturing firm open up its retail outlet. Whereas, if the organization retreats to the source of raw materials, is said to have made a backward integration. Example, the shoe company manufactures its own raw material such as leather through its subsidiary firm. Horizontal Integration: A firm is said to have made a horizontal integration when it takes over the same kind of product with similar marketing and production levels. Example, the pharmaceutical company takes over its rival pharmaceutical company.